A heartily welcome to all the students seeking admission to DOEACC & O & A LEVEL, BCC, CCC, BCA, MCA, BBA, MBA, BA, MA, JBT, B.Ed. courses through RAPID CAREER ACADEMY. The globalization and the privatization worldwide is unveiling greater opportunities for professionally qualified persons. Career planning has a cardinal importance for a student. You must go through the prospectus carefully and choose the cause of study considering your future plans. There’s a need for students to decide their career path after 10+2, which is the final stage of school life. There are innumerable fields available to be chosen but choosing the right career after 10+2 is a difficult and challenging task. There are many students who already know about their career choices but then there’s another lot who is in a dilemma of choosing what career is well suited for them. There are many factors that a student needs to keep in mind while going for a career option. Most crucial of which is whether the student is really interested in what he/she is choosing, if he/she has chosen a particular career will it be possible to cope up with the stress that comes attached to it, what are the possible job scopes after getting into the particular career, is it possible to meet the financial commitments of the chosen career. You can always look out for options and narrow down to the ones that satiate your quest of the right career choice. 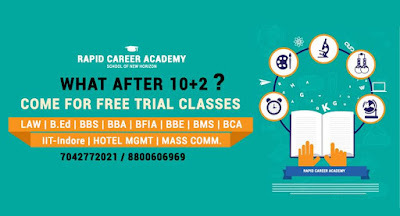 Rapid Career Academy, a career guiding institute has hosted the career of innumerable students, setting them on the right path. The institute also provides coaching for professional courses such as LAW, B.Ed., BBS, BFIA, BBE, BMS, Hotel Management, and MASS COMMUNICATION. Apart from all this, the institute provides excruciating career counselling sessions where a student learns a lot about his/her career goals, apprehensions and a lot more. All the problems are addressed by experts hence leading to the formation of a tepid tableau of success. Therefore, don’t be marionettes and blindly follow what your friends are pursuing, embrace individuality and let the right career institute help you choose the right career path after 10+2.